2015 update – The latest version of the Malik PUNK (pretty much all you can buy online now) is almost exactly the same specification as below, however now you benefit from the carbon wrap. An outer layer of carbon around the stick which gives a little extra ‘ping’ to you hits and passes. Who would have though the combination of a Pakistani company with a Dutch one would end up with a weird company? I love Malik, they don’t do things like the rest and that is fantastic! I must try to keep some normality to proceedings on besthockey.com so here’s a very normal review of the Malik PUNK Composite hockey stick. Benefiting from a great introduction to the Malik PUNK Composite stick from one of my wacky female teammates I can tell you straight up that this stick looks amazing. Though ill come back to it later, the Malik PUNK isn’t just about looks, nor are the looks the only unusual but great features of the stick. When I read about the stick originally I was drawn to the “Dribble Curve” shape listing. Being sad enough to review any hockey stick I thought this was another brands attempt at marketing. 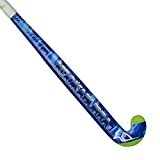 However everywhere I looked I heard great things about this shape, lots of reviews praising it and others from Malik hockey stick users trying to find equivalents from other brands, as if they are addicted to the shape. Technically the dribble curve on the PUNK Composite, like the rest of Malik hockey sticks, is different and maybe that’s what makes it so addictive. The 25mm bow starts at 280mm up from the ground, which is about halfway between the standard from most other brands which is either 250mm for their low bows or 300mm for straighter standard bows. What I was most impressed with when I address the ball is that it feels different. Personally I’m not a “low bow” person and I find that most of the standard bows come with a feeling that the brands designers have just said “well if you don’t want a low bow, we will stick another 50mm on it for you. Seems that Malik have actually though about it and chosen to place the curve in the centre of the stick. Weight wise I have held a 36.5” extra light version of the Malik Punk Composite stick and I must say it is light, a bit too light for me. If it’s 500g I would be surprised, great news if you want a light stick, not so good if you don’t. I would say though that combining the weight with the dribble curve in the Malik PUNK makes it a great option for a nippy player who wants to dribble fast through players. Compared to other sticks the Malik PUNK isn’t an out and out hitters stick, the carbon content in the composite is 60% with 5% aramid going in to reinforce impact areas and 35% glassfibre. It sounds like a high carbon content but perhaps because of the lightness it doesn’t seem to hit the ball that hard when you really take a smack at it. Obviously I have had the luxury of having a smash with other sticks so I’m a bit bias, for the most part I’m sure it is more than enough for everyday use. I read in another review of the Malik PUNK (here: http://www.fieldhockeyforum.com/threads/malik-punk.17848/ ) that the stick has a great feel when receiving the ball. Personally I didn’t have enough time to experience this myself but my teammate agreed with the sentiment. It certainly makes sense looking at the make up of the hockey stick in general. The pinky purple colour of the MALIK logo on the punk is bright, brighter than the pictures give it credit for. It’s almost red grape in colour but a little lighter. This interesting colour looks awesome against the black shaft which is kind of matte because of the carbon effect in it. Unlike the Square hockey sticks the Malik logo on the PUNK hockey stick is fairly lined up and straight, however it wraps around from the inside edge just slightly to maintain the Malik slightly bonkers style. Any stick from Malik with the super cool dribble curve is a fantastic option for players who want to have the ball under control when running with it. Add the lightness of the PUNK Composite to that and you have a winner for an agile (probably much younger than me) player. Chuck in to the mix the personal gratification you will get from running around the field with a work of crazy art from an awesome hockey brand and the Malik PUNK composite hockey stick could well be the stick for you. Make sure you check what weight you are buying; if you want a really light stick I’m not sure I’ve felt lighter than the extra light Malik PUNK, if you are put off by that the light option is for you. No one really know what specification Malik sticks are so don’t be put off by conflicting information online. If you are buying a Malik PUNK then you will be getting the same stick everyone else has. Buy the Malik PUNK and run like the wind, this stick will do everything in it’s power to help you keep control of the ball while you do.